Crispy Marshmallow Pumpkin Treats are the perfect treat to make for Halloween. 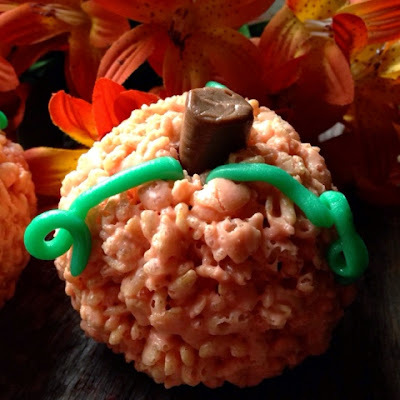 Crispy treats are packed together like snowballs or into pumpkin shapes, and then decorated with tootsie rolls, air-head candy and sprinkles. 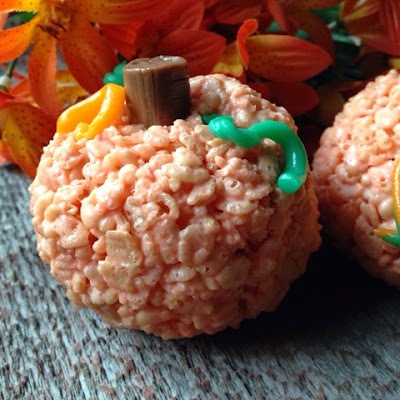 Your little ones will jump for joy when they see these cute Pumpkin Treats! They’re made from rice crispy cereal and marshmallows. They’re also easy to transport, which makes them great for school Halloween parties or bake sales. 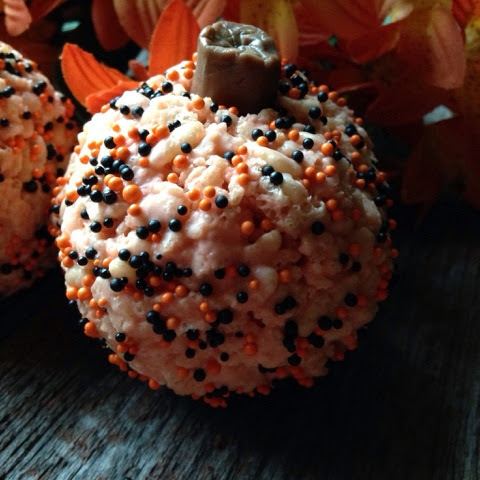 Make these pumpkin shaped treats and decorate them anyway you’d like. No matter how you decided to decorate these crispy treats, the best part is eating them. 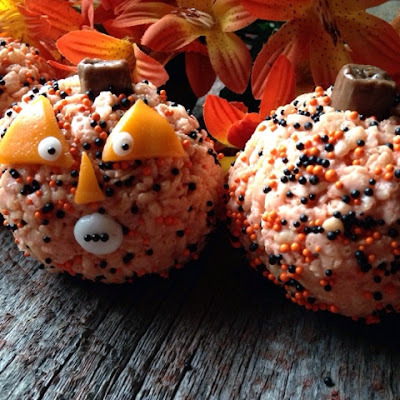 You can have tons of fun making these cute pumpkins. Make any shapes, designs or faces you want. In a large saucepan, combine the marshmallows and butter. Cook and stir over medium-low heat until melted. Remove from heat; tint orange with food coloring. Stir in cereal and mix well. With buttered hands, shape mixture into six large balls. You will need to pack the crispy treats like you would if you were making a snowball. Roll “pumpkins in sprinkles, if desired. Cut Tootsie rolls in half width-wise, press into top of each “pumpkin” for a stem. Roll Air Head strips between hands to form vines; press into each pumpkin near stem. Make faces with Air Heads, or use Fruit by the Foot to make vines and faces. Spooky Meringue Bones with Blood , Tutti Frutti Crispy Treats and Peanut Butter and Chocolate Bread, are all recipes you’ll want to try. They’re delicious! Hi Lynn, this is so cute. Thanks for sharing with Foodie Friends Friday this weekend. 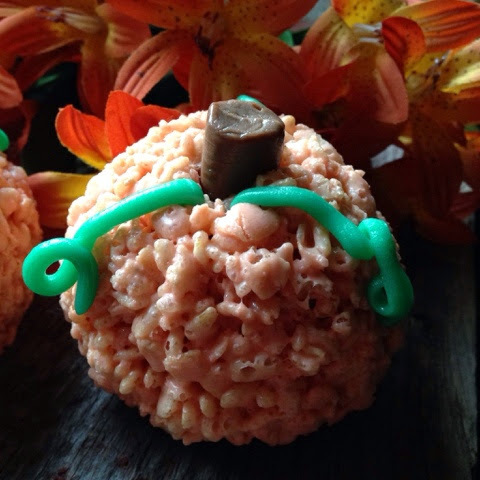 My grandson will love these pumpkin treats. Thank you for sharing your link on #purebloglove link party! That is too cute! Thank you so much for linking up at Tasty Tuesday! Your recipe has been pinned to the Tasty Tuesday Pinterest board! Please join us again this week!